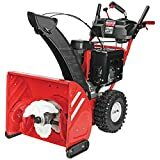 This is a Troy-Bilt Snow Blower Reviews post, we hope that these categories will make up your mind on which one is the best for you. Snow blowers introduce such great convenience that we can’t do without them in winter. As we comb the market for these machines, one particular brand stands out. 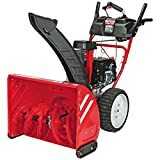 Troy-Bilt is not new to the world of snow blowers. In fact, it has a reputation for innovative designs in outdoor power equipment. They have leading features in their tools, and their snow blowers stand out as the best on the market. You may not know about all the models you can opt when picking from the Troy-Bilt brand. 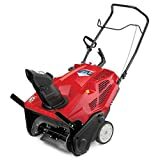 Our Troy-Bilt snow blower reviews will show the best models out there. That’s why we bring you a detailed overview of each design to help direct your choice. These machines carry powerful engines to offer superior performance for the heaviest snow storms. They also provide great comfort and easy to control functions. When snowfalls are light and powdery, there’s no need to invest in a massive machine. A single stage blower can do the work just fine. The Troy-Bilt 2100 is a single-stage blower which is engineered with excellent features to tackle most of your home snow cleaning jobs. It is ideal for small to medium driveways which can take three cars. Do you dread winter mornings because of snow cleanups? Well, you don’t have to wake up hours before since with this blower you can clean up a 21-inch wide driveway in just one pass. This model can clear up to 13-inches deep, so you don’t have to worry about it snowing the whole night. As long as the snow is fresh, you can take the least time and drive your car from the garage in a clean driveway. This blower has flexible functions. It comes with a remotely controlled chute which throws snow over a 190-degree panel. You can direct where the snow falls; as such you won’t be left with a pile in one place which will require more energy to move. What’s more, it comes with foldable handles to give you a comfortable height when working. This way, navigating around your compound is made effortless. The Troy-Bilt Squall has 208cc engine displacement. It generates such high torque to propel the auger and discharge snow at very high speeds. What’s more, it can clean down to the pavement such that you’ll not need your shovel to perform repeat jobs. Not forgetting; this machine is equipped with drift cutters which come in handy to break down the hard packed snow before discharging it. The only place you have a disadvantage is on gravel since it may pick up rocks and stones which may clog the chute and delay your progress. We always have high expectations with Troy-Bilt tools. The Squall only proves we can count on this brand to deliver the best snow thrower. It can clear wide and deep in one pass; thus saving you the much needed time and energy. Your limits are with gravel pavements, but you can take that up with the Troy-Bilt Two-Stage Snow Thrower. Carries a remote chute control for a custom throw. Has a well-designed auger system for efficient cleaning. Uses a 4-cycle engine; hence no mixing of oil and gas. Has an electric start button to eliminate the hassle of starting the motor in freezing temperatures. It cannot handle wet snow and ice with grace. The wheels are not engineered to self-propel. It’s a challenge pushing it up a flight of stairs because of the weight. This machine is bound to give any other two-stage blowers a run for their money. You can’t beat a heavy snowfall with just any other brand when you have the Troy-Bilt Storm. It is furnished with three steel blades and a serrated auger which resists sticky snow at the very least. You’ll love working with since it also comes with warm handles for your liking. An overhead valve engine (OHV) powers this equipment. It delivers the power and speed to move hundreds of pounds of snow. With 243cc displacement, you’ll be at a loss to give up such high performance. You can comfortably clear 26inches wide and 21inches deep of snow with the 12-inch auger. This means you’ll not spend any second longer in the frozen temperatures. This machine comes with X-Trac wheels which make navigation a breeze. They can move through heavy snow with ease and what you need to do is just walk behind it. This is because as a two-stage blower, the tires are self-propelled. Not to mention; it comes with six forward speeds and two reverse to achieve total control. You’ll be able to move snow at your pace, and following the type of snow, you’ll be clearing. It can push hard packed ice and wet snow at the same speed thanks to the 8inch clog-resistant chute. The Xtreme auger breaks down the ice before letting it into the impeller for rapid discharge. With the two-way joystick, you’ll be able to control the throw over a 200-degree rotating chute. This convenience does not end here as the functions can be mastered with one hand as the other directs the machine. A big storm cannot put you down when you have the Troy-Bilt Storm. It can handle everything you throw at it so get ready to be moved by the great power and excellent performance. The engine delivers, and the functions are easy to master. You can be in control of your snow throwing when you choose the Storm to do the work for you. The Storm 3090 is built for the extremities. 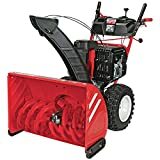 It can clear 30-inches wide and 21-inches of snow without a hassle. The two-stage system is equipped with a steel notched auger which makes it easy to plow through the wettest snow and deliver a clean driveway. With the 12-inch impeller, it is sure to discharge pounds of snow to far distances within minutes. This blower comes with 16-inch X-Trac tires to make your work easier in the toughest winter conditions. It allows for one-hand operations such that you can direct the throw and the speed without stopping. With the power steering system, it becomes even easier to navigate on tight areas around your compound. The Storm 3090 is equipped with a remote overhead crank. It lets you make swift snow discharge by directing the chute. You won’t be contending with large piles in one position as you can lay the snow evenly in four ways over 200-degrees. Better still your hands will always feel warm in the freezing temperatures as it comes with heated grips. It assures you of safety from hypothermia even when you work for extended hours. Avoid wasting time with the electric power start which fires up the engine in minutes. It uses a 120V power cord to get the machine to run in subzero temperatures. Even better it has a 357cc displacement which means it can power through the deepest snow. Expect this blower to be consistent, and with the help of the skid shoes, you can work on all the surfaces around your home. Talk of wooden decks, clay courts, and even gravel sidewalks. This is because it does not scrap the floor; hence it will preserve your floor surfaces. The Storm 3090 beats the odds when it comes to the functionality of two-stage blowers. It has intuitive controls and excels in the toughest winters. It is intended for extensive areas, and as such, you should only invest in it if you expect snowfalls deeper than 10-inches deep. Handles all types of snow on all surfaces. It achieves high performance in blowing capacity. Resists clogging for consistent jobs. Tank capacity is smaller than on regular two-stage blowers. It takes up a large storage space. The Vortex takes snow blowing to another level. It comes with an accelerator which crunches snow at speeds of up to 10 times higher than with a two-stage blower. It is the remedy for the heaviest snowfalls which threaten to keep you in the house all day. Needless to say, this blower excels in versatility, durability, and performance. This model powers through snow up to 26-inches wide and 21-inches deep in one pass. If you have to pack six cars, this is your go-to machine. It comes with four blades which can cut through ice and wet snow effortlessly. You don’t need to worry about the pile at the end of your driveway since this machine can move through it with an exceptional drive. Better still, it comes with a four-way joystick for absolute control of the direction and distance of snow blowing. It gets better when it comes to navigating with this machine. With the help of self-propelled wheels; you touch a dial, and the unit turns smoothly. You’ll not be exerting any extra force to propel it. It even comes with 15-inch X-Trac tires which help in fast plowing through snow. You’ll like working with the six forward speeds plus two reverse in that you can lock the speed you choose for added convenience. The Vortex is an exceptional model since it has a reinforced steel housing. You can depend on it to last many years in good condition. Even better, it has an aluminum gear case which assures of resilience amidst heavy usage. You’ll love that it comes with an electric start and halogen lights so you are not restricted to the time of day you can work. What’s more, the hand grips are also heated to ensure you are comfortable when the air is crisp. This snow blower is heavy-duty equipment. It is in a lane of its own as the features cannot be compared with any other blower. It is made to tackle most challenging snow throwing tasks. You can count it to move snow and do it efficiently and effortlessly. It is the best three-stage snow thrower you can pick for your needs. It can work on all types of surfaces. Has high engine displacement for excellent snow throwing. Can cut through packed ice with ease. It has large snow throwing capacity. It is easy to control through power steering. It is a bit expensive owing to the added features. The belt wears out if not well maintained. We must say that the blowers above are very outstanding. They cover a vast array of applications, so it is challenging to pick just one of our best pick. The Troy-Bilt Storm strikes a balance between functionality and versatility. It is not as big to give you a headache when storing and it is not as small to be challenging in wet snow and ice. If you have a medium sized driveway, walkway or sidewalk, this is the machine for you. 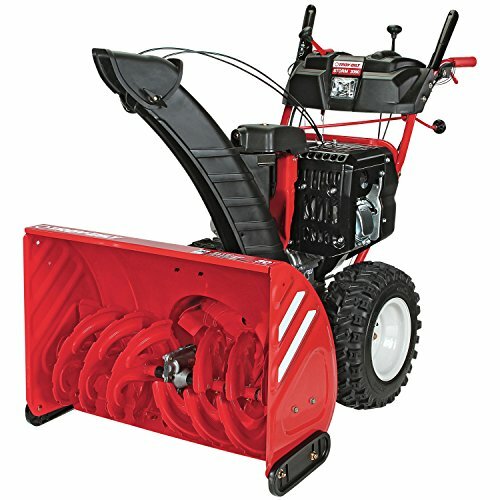 Troy-Bilt has a line of the best snow throwers on the market. The list above exhausts the best designs ever presented by this brand. These models have surpassed what other snow blowers offer and as such, they deserve special mention. We hope you can now have a pleasant time choosing your next snow thrower. I hope that Troy-Bilt Snow Blower Reviews was helpful to you.